We were delighted to attend the official launch of the Do You Mean Me? website at Malone College in South Belfast today. 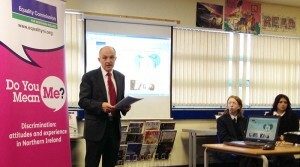 Michael Wardlow, Chief Commissioner for the Equality Commission for Northern Ireland introduced the website to some of the young people from the school. To view the live site click here: Do You Mean Me?